to stop at James Dean's grave site to discover another geocache. After 57 years he still has admirers. we took a short hike into the snowy woods. 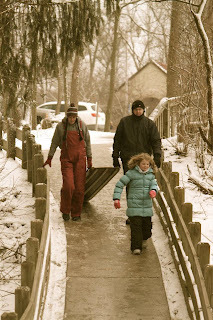 We headed up to Pokagon State Park to try the toboggan run. Hmmmm, it doesn't look too scary. Coming out of the chute. A quarter of a mile long track. Snowballs or not, we had fun! A nearby parks department is having a contest to find geocaches. and use a GPS enabled device to find a hidden container. My daughter, an avid geocacher, with two of her kids & myself set out on the adventure. The geocache team headed down an urban trail. Usually the caches have a small toy or momento inside. This one had shoe patches from the parks department. We found this micro geocache, a tiny capsule, in the hole in this stone wall. Wonder where the cache is? I'm back home to Indiana & winter. We've gotten a little snow. Boyce Thompson Arboretum State Park. We saw lots of varieties of cacti and succulents. saw Australian, Chihuahuan, and Sonoran Desert areas. home of the original settler. as well as pecan, olive & pistachio trees. A great way to end our visit to the desert. While in Arizona, we attended the Barrett Jackson auction. 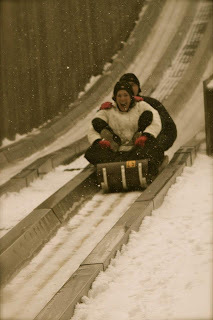 Although this was hubby's idea, I ended up enjoying myself. and anything else related to moving vehicles. The cars may have been old, but they looked anything but. Did anyone else ever hit their head on one of these as a child? This hearse carried President Kennedy's body.